1976: Ryan's Hope's Delia searched for evidence against Frank. 1978: All My Children's Erica Kane married Tom Cudahy. 1985: General Hospital's Robin Scorpio arrived in Port Charles. 2011: All My Children's Erica met Verla Grubbs. 1948: On radio soap opera Claudia, Claudia (Dorothy McGuire) had opening night jitters. 1976: On Another World, Sharlene Frame (Laurie Heineman) confessed her sordid past to a devastated Russ Matthews (David Bailey), then downed a bottle of pills. 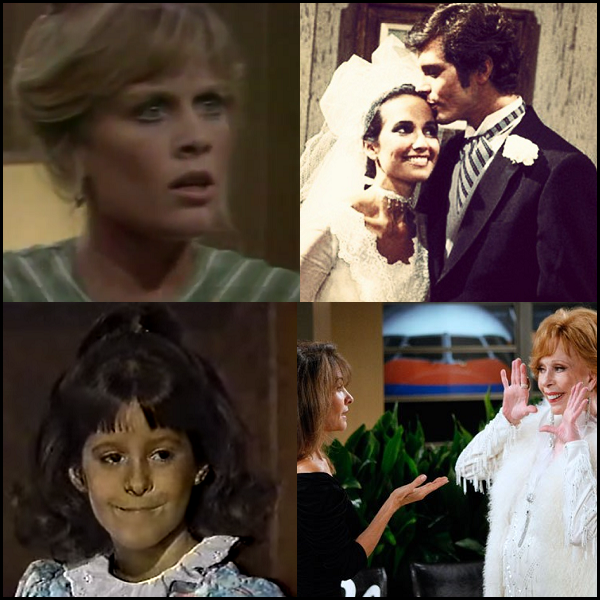 1978: On All My Children, Erica Kane (Susan Lucci) married her third husband, Tom Cudahy (Richard Shoberg). 1984: On Another World, in an attempt to keep her away from Ben McKinnon (Richard Steen), Donna Love (Anna Stuart) asked Hunter Bradshaw (Robert Sedgewick) to take her "sister" Marley (Ellen Wheeler) to school. Meanwhile, Donna hid Catlin Ewing (Thomas Ian Griffith) in a secret room in her wine cellar. Elsewhere, Felicia Gallant (Linda Dano) and Cass Winthrop (Stephen Schnetzer) met Kathleen McKinnon (Julie Osburn), who interviewed for the position of Felicia's personal secretary. 1984: On The Edge of Night, Raven (Sharon Gabet) and Sky Whitney (Larkin Malloy) felt the baby kick. 1985: Kimberly McCullough made her first appearance on General Hospital as Robin Scorpio. In the episode, Robert Scorpio (Tristan Rogers) came home and found Robin in his living room. 1986: British drama Casualty premiered. 1989: On As the World Turns, Paul Stenbeck (Andrew Kavovit) told the Oakdale PD the story of how and why he shot his father, James. 1996: Krista Allen debuted as Billie Reed in Days of our Lives. 2003: Actress Louise Platt, who played Ruth Jannings Holden on The Guiding Light in the 1950s, died at age 88. 2006: On Days of our Lives, EJ DiMera (James Scott) tried to help Sami Brady (Alison Sweeney) after she learned Will was missing. Later, Sami revealed to Lucas Horton (Bryan Dattilo) she had been receiving threatening notes for months. 2011: Carol Burnett returned to All My Children as Verla Grubbs. I wish the scene of Sharlene telling Russ about her past was available. It was riviting.